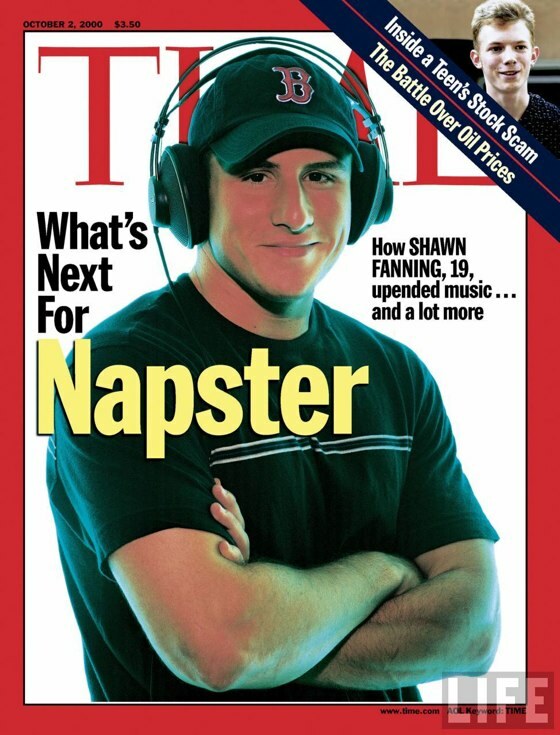 The heyday of Napster seems like a foggy fever dream, and although the online peer-to-peer file sharing service only lasted two years, Napster changed the music industry and our relationship to music forever. Tonight at the Trylon, Sound Unseen presents the new documentary Downloaded directed by Alex Winter (better known as Bill in Bill and Ted’s Excellent Adventure) that takes a look at the innovative company, the subsequent legal battles and the far reaching effects of its brief existence. 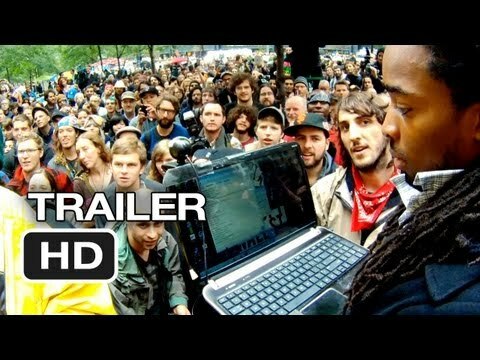 Downloaded screens Wednesday, July 10 at 7:00pm. Advance tickets are available on the Trylon website. We continue our look back at the films of Guillermo del Toro by skipping his more mainstream action-sci-fi entry Mimic and moving to the film that sealed his Spanish Gothic trademark. 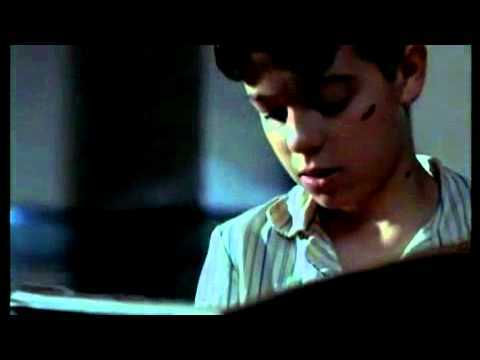 Produced by Pedro Almodóvar, The Devil’s Backbone was del Toro’s first chapter in his now stalled Spanish Civil War trilogy. The film takes place in 1939, the final year of the Spanish Civil War at a remote school that functions as an orphanage for the country’s fatherless sons and as an outpost for the resistance against the Nationalists. It is under this oppressive historical context that del Toro builds his one-of-a-kind ghost story, a reflection of power, corruption and violence that will rule Spain for the next 36 years. 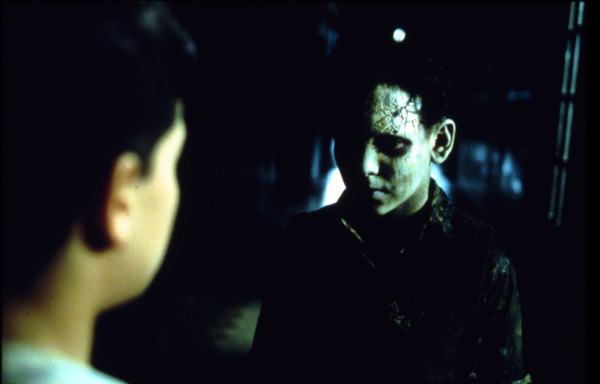 The Devil’s Backbone screens Monday, July 8 and Tuesday, July 9 at 7:00 and 9:00. Advanced tickets available at the Trylon website. Ok, more than half the cast is British, but is there any better movie to celebrate July 4th than The Great Escape? I think not! The Trylon will be showing John Sturges’ prison escape classic all weekend. Get out of the heat, grab a popcorn and celebrate with Steve McQueen. Not to mention: James Garner, James Coburn and Charles Bronson…and a bunch of UK actors with names like Nigel. In anticipation of Guillermo del Toro’s massive Pacific Rim hitting theaters July 12, the Trylon will take a look back at del Toro’s more subtle and creepy beginnings. His debut, Cronos, is a stylish take on the myth of the vampire. 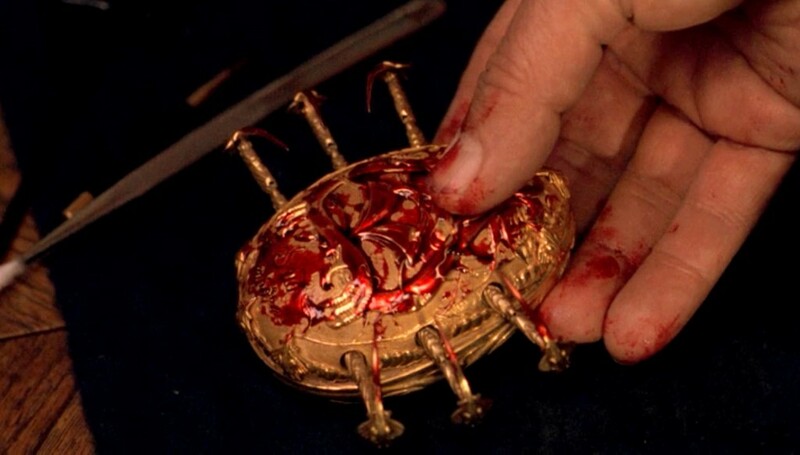 Variety called it “a unique, terrifying mini-masterpiece.” The tiny little life-giving blood-drawing mechanism in Cronos may be a far cry from the mecha v. monster madness of Pacific Rim, but there is no doubt that Cronos, made only ten years ago, served as incubation for del Toro’s one-of-a-kind flair. Cronos plays Monday, July 1 and Tuesday, July 2, 7:00 and 8:45 both nights. Advanced tickets are available at the Trylon’s website. 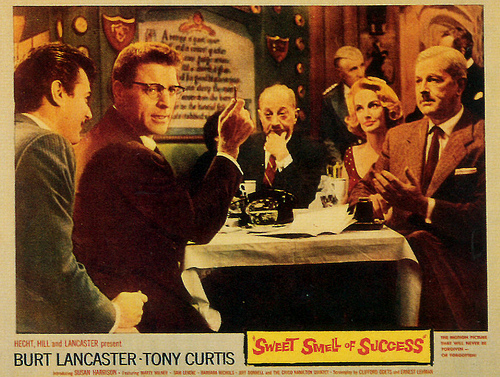 Posted on June 27, 2013 by Peter Schilling Jr.
Sweet Smell of Success (1957), directed by Alexander Mackendrick, written by Clifford Odets and Ernest Lehman, and starring Burt Lancaster and Tony Curtis. Showtimes: Friday and Saturday, 7:00 & 9:00; Sunday, 5:00 & 7:00. Purchase Tickets Here. Review by Trylon volunteer David Berglund, who writes about the movies with his wife, Chelsea Berglund, at their Movie Matrimony blog. With vibrant and confident strokes, Alexander Mackendrick’s Sweet Smell of Success captures the concurrent excitement and angst of life in an immense, overcrowded, and treacherous American metropolis. According to Mackendrick, the allure of the city is rooted in success and power. The film deftly displays that such pursuits are fraught with the temptations of pride, and the consequences of loneliness and anxiety. It is a warning to all prospective urban socialites that the road to glory is frequently marked by the abuse of inferiors and ends with an existential void. Success tells the story of J.J. Hunsecker (a devilish turn from Burt Lancaster), a powerful gossip columnist, who uses the influence of his position to manipulate press agent Sidney Falco (a harried Tony Curtis) into being the middleman of a plot to halt his younger sister’s marriage to a lowly jazz musician. Hunsecker finds no joy in his work. He is simply a businessman who has found a rich and limitless market–the lives of others. In the words of King Solomon, “The words of gossip are like choice morsels; they go down to the inmost parts.” And with any such deep-seated urge, there is always a business opportunity to be exploited by those not tempted by its charms. Hunsecker’s industry is ironically impersonal, dispassionately dealing in the most personal realities of other lives. As with the darkest aspects of corporate America, his end goal is not money, but the esteem and respect this money brings. Yet, just as Solomon succumbed to the wiles of his vices, Hunsecker also carries a fitting tragic flaw and falls into the snare of his own success. He, too, seeks for meaning and purpose in the lives of others, but unlike his readers, cannot escape the spotlight. As a gossip columnist thriving on the unseemly secrets of others, he must avoid having any secrets of his own. His attempts to control his sister indicate a deeper, more widespread dilemma – there is no rest when relying on others for contentment. For Hunsecker, this means a foolish desire for control that fuels an insatiable thirst for power, and for everyone else, this means they better watch their backs. It is fitting that a British director would be able to tackle such an American story, for it is many times the outsider who has the best vantage point. Mackendrick’s big city and its sensationalistic media outlets represent an insulating force that feeds on the deception of vanity and swiftly blinds its inhabitants to the needs of others. Yet, there is something universal to learn from this – everyone, whether urban or rural, has felt the compulsion to find their worth in others. 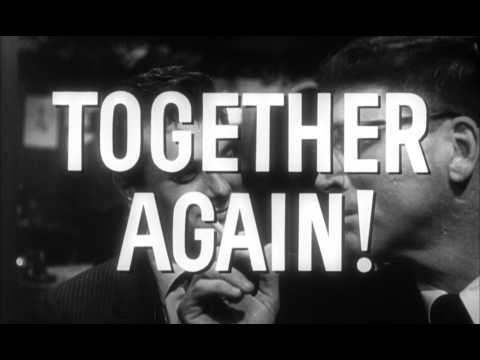 The intrinsic sarcasm of the film’s title answers with a bold indictment – if success is defined in the admiration of others, the pursuit will only bring a bitter outcome. Westworld Kicks Off Our Dystopian 1970s Series January 1! Great Scott! “Back To the Future” I, II and III screen at the Trylon this weekend! © 2019 Perisphere, all rights reserved.